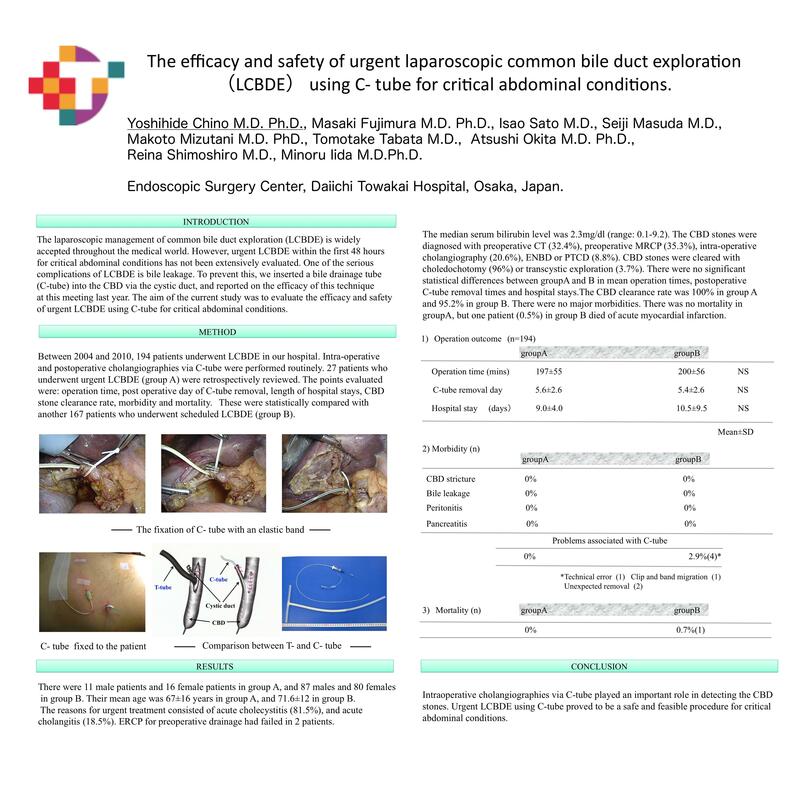 The Efficacy and Safety of Urgent Laparoscopic Common Bile Duct Exploration(lcbde) Using C- Tube for Critical Abdominal Conditions. The laparoscopic management of common bile duct exploration (LCBDE) is widely accepted throughout the medical world. However, urgent LCBDE within the first 48 hours for critical abdominal conditions has not been extensively evaluated. One of the serious complications of LCBDE is bile leakage. To prevent this, we inserted a bile drainage tube (C-tube) into the CBD via the cystic duct, and reported on the efficacy of this technique at this meeting last year. The aim of the current study was to evaluate the efficacy and safety of urgent LCBDE using C-tube for critical abdominal conditions. Between 2004 and 2010, 194 patients underwent LCBDE in our hospital. Intra-operative and postoperative cholangiographies via C-tube were performed routinely. 27 patients who underwent urgent LCBDE (group A) were retrospectively reviewed. The points evaluated were: operation time, post operative day of C-tube removal, length of hospital stays, CBD stone clearance rate, morbidity and mortality. These were statistically compared with another 167 patients who underwent scheduled LCBDE (group B). There were 11 male patients and 16 female patients in group A, and 87 males and 80 females in group B. Their mean age was 67±16 years in group A, and 71.6±12 in group B. The reasons for urgent treatment consisted of acute cholecystitis (81.5%), and acute cholangitis (18.5%). ERCP for preoperative drainage had failed in 2 patients. The median serum bilirubin level was 2.3mg/dl (range: 0.1-9.2). The CBD stones were diagnosed with preoperative CT (32.4%), preoperative MRCP (35.3%), intra-operative cholangiography (20.6%), ENBD or PTCD (8.8%). CBD stones were cleared with choledochotomy (96%) or transcystic exploration (3.7%). Mean operation times, postoperative C-tube removal times and hospital stays in groups A and B were 197±55min and 200±56 min, 5.6±2.6 days and 5.4±2.6 days, 9.0±4.0 days and 10.5±9.5days, respectively. There were no significant statistical differences between the two groups. The CBD clearance rate was 100% in group A and 95.2% in group B. There were no major morbidities such as bile leakage, common duct stricture, bile originated peritonitis, and postoperative pancreatitis. There was no mortality in group A, but one patient (0.5%) in group B died of acute myocardial infarction. Intraoperative cholangiographies via C-tube played an important role in detecting the CBD stones. Urgent LCBDE using C-tube was a safe and feasible procedure for critical abdominal conditions.